348 Marlborough is located on the south side of Marlborough, between Gloucester and Hereford, with 346 Marlborough to the east and 350 Marlborough to the west. 348 Marlborough was built in 1878-1879 for building contractor George Wheatland, Jr., one of eight contiguous houses (348-350-352-354-356-358-360-362 Marlborough) built in 1878-1880 for him. Click here for an index to the deeds for 348 Marlborough. The original permit application for 348-350-352 Marlborough (one application for the three houses) was submitted on December 3, 1878, by George Wheatland, Jr., William D. Pickman, and Richard Sullivan Fay (William P. Fay’s brother). The owners then divided the lots among themselves. On December 17, 1878, 348 Marlborough was transferred to William D. Pickman and 350 Marlborough was transferred to Richard Sullivan Fay. William P. Fay died in March of 1879, and the transfer of the third lot was delayed until October 3, 1879, after the house was completed, when it was transferred to George Wheatland, Sr.
On July 12, 1879, 348 Marlborough was purchased from William Pickman by Mrs. Sarah Augusta (Putnam) Heath, the widow of merchant John Andrew Heath. She previously had lived at 20 Marlborough. Her adult sons, John Andrew Heath, Jr., and Nathaniel Heath, both stockbrokers, lived with her. John Heath married in June of 1886 to his first cousin, Caroline Putnam Newhall, daughter of Thomas B. Newhall and Susan Silver (Putnam) Newhall. 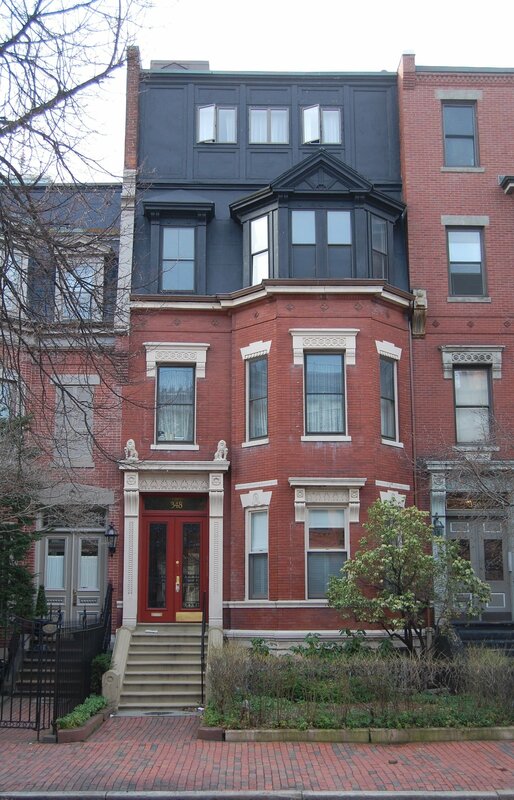 After their marriage, they lived with his mother and brother at 348 Marlborough. Sarah Heath died in November of 1901. Nathaniel Heath and John and Caroline Heath (and their children) continued to live at 348 Marlborough during the 1908-1909 winter season, but moved thereafter to Swampscott. On October 25, 1909, 348 Marlborough was purchased from John and Nathaniel Heath by Wallace Clement Sabine. He and his wife, Dr. Jane Downes (Kelly) Sabine, made it their home. They previously had lived in an apartment at 481 Beacon. Wallace Sabine was a physicist who founded the field of architectural acoustics, serving as a consultant in the design of various Harvard Buildings, Boston Symphony Hall, and other major structures. He was a professor of physics at Harvard and served as Dean of Harvard’s Scientific School. Jane (Kelly) Sabine was a physician and surgeon, and was one of five women surgeons elected to the American College of Surgeons when it was organized in 1913. During the 1916-1917 winter season, the Sabines were living in France where Wallace Sabine was an exchange professor, and Jane Sabine was on the surgical staff of the first Red Cross hospital in Paris. While the Sabines were in Europe, 348 Marlborough was the home of Kenneth Moller and his wife, Elizabeth Soule (Sweetser) Moller. In 1916, they had lived in Providence, where he was a mechanical engineer with the Jenckes Spinning Company. By 1918, they had moved to 393 Beacon. Wallace Sabine died in January of 1919. Jane Sabine continued to live and maintain her medical office at 348 Marlborough (listing herself both as Mrs. Wallace C. Sabine and Dr. Jane D. Kelly Sabine in the Blue Books). As built, 348 Marlborough included a partial fourth floor at the rear of the house, extending about half way towards the front. Sometime in the 1920s, the fourth story was extended to be a full floor. The house is shown as a three and one-half story house on the 1922 Bromley map and as a four story house on the 1928 map. From the mid-1920s, 348 Marlborough was shown as a four-family dwelling in the Building Department records. However, the permit application converting the house from a single-family dwelling into four units is not included in the Department’s files and Dr. Sabine occupied the house as a single family dwelling. On March 1, 1927, Jane Sabine transferred 348 Marlborough into her name and the name of her daughter, Janet Sabine. On August 26, 1929, Janet Sabine transferred her interest back to her mother. The next month, she married Frederic Alexander Ley, a civil engineer and building contractor; after their marriage, they lived in New York City. Jane D. Kelly Sabine continued to live at 348 Marlborough until her death in February of 1950. On September 29, 1950, 348 Marlborough was purchased from the estate of Jane D. Kelly Sabine by Harry E. Thorson, a teletype operator for United Press International, and his wife, Harriet (Harriette) V. Thorson. They previously had been lodgers at 4 Marlborough. The Thorsons occupied the house as a multiple dwelling, probably converting it into the four apartments for which it was already approved. They continued to live at 348 Marlborough until the early 1960s. On August 10, 1961, 348 Marlborough was purchased from the Thorsons by Joseph L. Paley and his wife, Roxy Ann (Stoloff) Paley. They lived in one of the apartments until the mid-1960s, when they moved to Brookline. On July 12, 1965, 348 Marlborough was acquired from the Paleys by John F. Kelly, Jr.
On June 20, 1966, 348 Marlborough was acquired from John F. Kelly, Jr., by attorney Robert J. Pleshaw and his wife, Geraldine A. (Brown) Pleshaw. They previously had lived at 50 Peterborough. They continued to live in one of the apartments at 348 Marlborough until about 1971. On August 10, 1971, 348 Marlborough was acquired from the Pleshaws by Ethel E. (Mastroyin) Baines, the wife of Keith Jojm Cooper-Baines, a building contractor. They lived in one of the apartments. They previously had lived in an apartment at 447 Beacon. 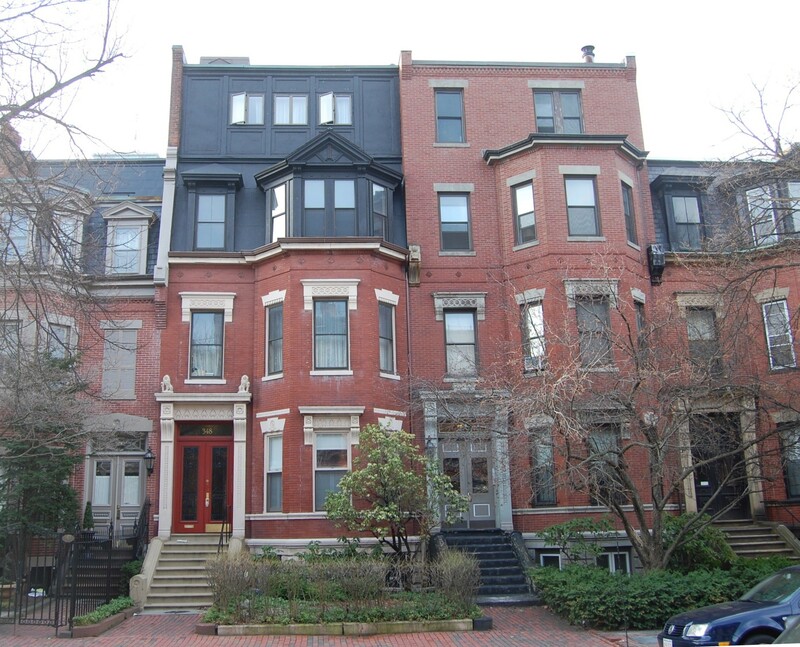 On July 11, 1973, Ethel Baines transferred the property to her husband and Mac Clanning Grant, as trustees of the 348 Marlborough Street Trust. On January 11, 1974, 338 Marlborough was acquired from Keith J. Cooper-Baines and Mac Clanning Grant by Sheldon Bennett. He lived in one of the apartments. On February 10, 1981, he transferred the property to himself as trustee of the 348 Marlborough Street Realty Trust. On June 9, 1983, Paul L. Bentel and Peter A. Bentel purchased 348 Marlborough from Sheldon Bennett. 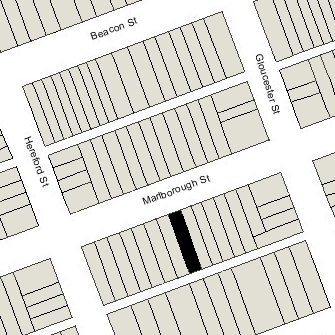 On November 4, 1984, they converted the property into four condominium units, the 348 Marlborough Street Condominium.